Whether you're ready for a romantic getaway for two, a fun family vacation, a girls' shopping weekend, or a relaxing break with good friends, Gatlinburg, Pigeon Forge, and Sevierville, Tennessee, are the perfect playgrounds for kids and adults alike. The Great Smoky Mountains have a reputation as the perfect family-friendly vacation spot, and for good reason. There's so much for kids and adults to do together that you may need more than a week to experience everything. Regardless of your age, the best way to have fun in the Smokies is to act like a kid. 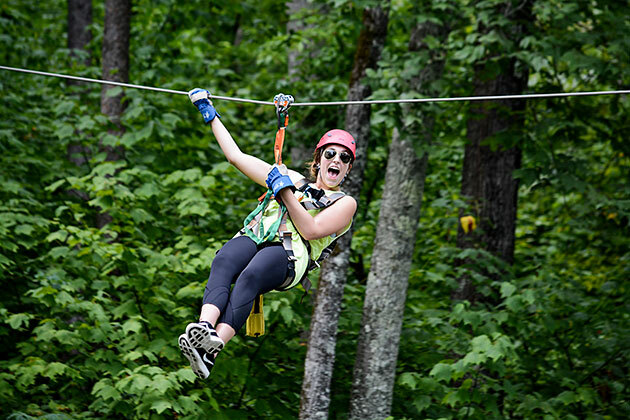 A great place to start is with an exciting zipline tour. Ziplining is fun and safe for the whole family, and kids who weigh less than 100 pounds can ride tandem with a certified guide. Once you're all hooked in, you'll zoom from tree to tree (with moments where your feet may brush the ground) for hours. You can also brave sky bridges and enjoy a bird’s eye view of spectacular scenery. Some tour operators even offer sunset tours that let you enjoy the Smokies in an entirely different atmosphere. Whitewater rafting on the Upper Pigeon River is a wonderful way to cool off and enjoy the great outdoors together. Families with kids 3 and older can raft the small, gentle waves of the Lower Pigeon River, and kids 8 and older can raft more moderate class 1 to 4 rapids in the Upper Pigeon River. Teenagers and adults can enjoy even more extreme courses on the Upper Pigeon River; just ask your outfitter which trip is appropriate for the ages in your group. For tike-size thrills, a day at Dollywood enjoying rides and games will be a favorite family memory. Older kids and adults won't want to miss the new Lightning Rod roller coaster; the world's first launched and fastest wooden coaster. Of course, Dollywood has plenty of rides that the whole family can experience together. Plus there are exciting shows and lots of food to round out your day. A new and not-to-be-missed attraction in Gatlinburg is "Impossibilities," a magic show by world-famous magicians Chris Collins and Erik Dobell. This dynamic duo knows how to keep kids — and adults — entertained. A consistent family favorite is Ripley's Aquarium of the Smokies in Gatlinburg. At this interactive museum you can waddle with penguins, splash with stingrays, sleep with sharks, and pet jellyfish. The best deal is the combo ticket, which combines entry to the aquarium and your choice of two other Ripley's attractions, including Ripley's Believe It or Not! Odditorium, the Marvelous Mirror Maze, the Haunted Adventure, the 5D Moving Theater, and mini golf. For a family activity you'll never forget, take a hot-air balloon ride for unbelievable views of the Smoky Mountains, Cherokee and Douglas Lakes. Balloon rides take place at dawn for memorable sunrise trips or at dusk for unforgettable sunset views. Whether you rent a cozy cabin with romantic views of the Great Smoky Mountains or a spacious chalet with a movie room that can hold the whole extended family, spending downtime relaxing and having fun in your very own mountain home away from home is sure to be the highlight of your trip. No matter your age, the Great Smoky Mountains have something for everyone. From exciting adventures such as whitewater rafting, riding roller coasters, ziplining or hot-air balloon rides to enriching activities such as museums and magic shows, the Smokies are the perfect setting for a memorable, family-friendly vacation.